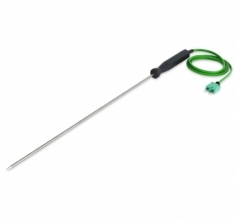 Temperature Probe - This extended, stainless steel, thermocouple penetration probe is tough and versatile and can be used for a variety of applications. Ideal for measuring temperature in a wide variety of applications including liquids and semi-solids. It has a probe diameter of 3.3mm, probe length is 300mm. Response time less than three seconds. Maximum probe temperature 250°C. Can be fitted to any ETI thermometer with a thermocouple socket.